Will there be goal action under the Nye Camp lights on Tuesday? 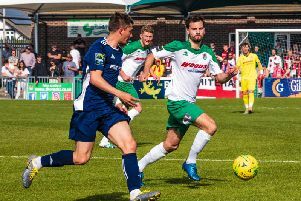 Bognor boss Jack Pearce is looking forward to a potentially explosive game when the Rocks host Seaford Town in the Sussex Senior Cup next week. But first the Rocks manager is gearing the club up for a fireworks extravaganza to help boost club funds. The Rocks are staging their annual fireworks night this Sunday (Nov 4) at their Nyewood Lane ground, just two days before they take on the Badgers in an enticing second round clash. Paul Harrison’s men sit in a healthy fifth position in division one of the Southern Combination Football League and Pearce is warning his charges not to be complacent going into the game on Tuesday (7.45pm). He said: “We know they are up for the game and I’m sure it will be a lively encounter. Let’s hope the game is one with explosive moments on the pitch, but we’ll save the fireworks for Sunday! They'll come to us with a good attitude and a certain amount of confidence given their league position. We must be on our game and ready to compete and hopefully express ourselves through our football and get a win." The good news for fans is that both clubs have agreed discounted admission prices of adults for £5, while under 18s can gain admission for free! Bognor last played Seaford in the same competition in November 2010, winning 6-0 at Nyewood Lane. *The annual evening of fireworks and fun boasts arena events, hot food and a licensed bar! Gates open 5.30pm. Fireworks 7pm. £5 admission, children under five free.